Detailed informations about requirements before installation, the steps performed by the BibGlimpse.SETUP script, as well as how to configure BibGlimpse to work with an existing Apache server are documented below. For examples how to setup your system to meet the BibGlimpse requirements, please refer to the Setup examples page. There, we provide example scripts that automatically install all required packages on the latest 64 bit versions of three of the most common Linux distributions, namely ubuntu 8.04.1, fedora 9 and openSUSE 11.0. Besides, the BibGlimpse.SETUP script tries to warn you about missing components upfront, by testing for these requirements. Required Apache information includes the server name and port, paths to the httpd.conf file, the htdocs/ and the cgi-bin/ directory plus the equivalent URL on the server, as well as the name of the web user running the Apache. Moreover, you need to have permission to write into Apache's htdocs/ and cgi-bin/ directories, both as yourself and as the web user running the server. To this end, you might want to consult the sysadmin in charge of the Apache. Note that all the Apache settings become irrelevant, when a local installation is performed (LOCAPA='Y'). 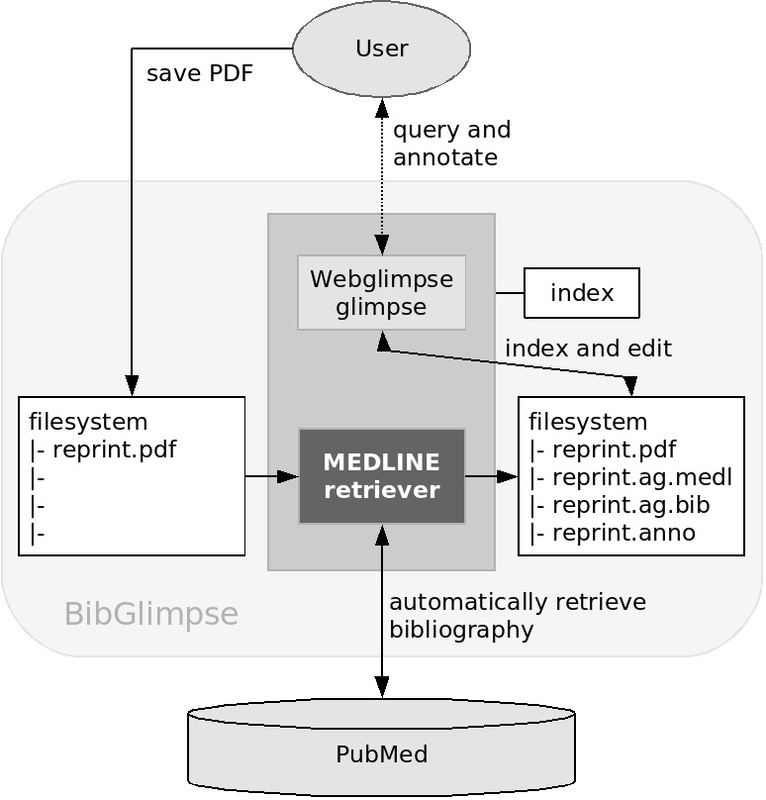 BibGlimpse extends Webglimpse's PDF indexing feature with automated bibliography retrieval from PubMed and by supporting user annotations. Glimpse provides the powerful file indexing and query engine to make large collections of texts full-text searchable. It is a command line tool and was first developed by Udi Manber, Burra Gopal and Sun Wu at the University of Arizona in the early 90's. Webglimpse is a web interface to search and manage archives indexed with glimpse. It has been widely used for over 10 years now and is maintained by Golda Velez. BibGlimpse adopts Webglimpse's capability to index PDF files to enable its usage as a scientific reprint management tool. It adds automated bibliography retrieval from PubMed (implemented as a MEDLINE retriever Perl script) and supports user annotations. being automated in the BibGlimpse.SETUP script, we will nevertheless give a detailed description for each of them below. In addition there is also extensive documentation available from the Webglimpse installation site. This will try to install glimpse in /usr/local/bin. If you do not have root rights, or if you want to install into another path, you will want to change this using configure with the --prefix flag or according to the Configure and Install glimpse section of Webglimpse. Either way, you need to remember where you installed the glimpse binaries to. If glimpse is installed properly, this will find exactly one hit for fieldA containing foo in files/test 2.txt. such that all handled parameters can be found in wgInput.txt and the corresponding output is entirely logged in wgInput.log. If you happen to encounter a problem installing Webglimpse, these files might thus contain helpful information. Note that these files also define the Webglimpse administrative login and password with the default admin and admin. To enable the BibGlimpse features, the standard Webglimpse distribution needs to be adapted appropriately (exchanging some files, setting some flags and paths). The main purpose of these modifications is to make Webglimpse index PDFs with xpdf's pdftotext command. The 'Indexing PDF documents with xpdf' page describes the procedure to enable this Webglimpse feature in detail. For BibGlimpse, however, the relevant shell script usexpdf.sh was further extended, such that it does not only convert a PDF to text, but that it also calls the BibGlimpse script wrMedline.pl to retrieve the corresponding MEDLINE entry for the PDF in question. To search PDFs and bibliography via Webglimpse's webinterface webglimpse.cgi, the above modifications would be sufficient. For appropriate display of bibliography and online editing of annotations, however, BibGlimpse provides its own interfaces wrsearch.cgi and wrrepos.cgi. The last modifications, hence, enable the usage of these two CGI scripts. Comments and explanations how the BibGlimpse.SETUP makes all these modifications are available in the script itself. So like for the Webglimpse installation, the handled settings as well as the received output are logged in wgcmdInput.txt and wgcmdInput.log. By that time, you should have created a file structure like in the example installation. To periodically reindex the $WG2PRE/prints/ directory, the $WG2PRE/wg2/archives/1/wgreindex command can be called from the crontab (cf. man crontab). As stated before, it is important to run the reindexing command as the web user. Webglimpse provides some additional documentation reindexing from crontab . To keep installation and maintenance overhead small, BibGlimpse was built without elaborate user management features. Exploiting simple directory tree structures and Apache's .htaccess directory-level configuration files, it is nevertheless easily possible to enable basic user management functionality; just give different users their own subdirectories in the indexed tree and arbitrarily restrict access with .htaccess files inside these directories. Apart from securing the repository from the outside, this will for instance also allow you to list all files of usera with a field search for name=usera# and the last user who changed an annotation will be displayed on the corresponding repository site. In case you were using an existing Apache, you will also have to remove the scripts from its cgi-bin/ directory, as well as the symlink to your prints/ directory from the htdocs/ path.